The prescriptive follow-up to the New York Times bestseller The Dream Manager. One of the major issues in our lives today is work-life balance. Everyone wants it; no one has it. 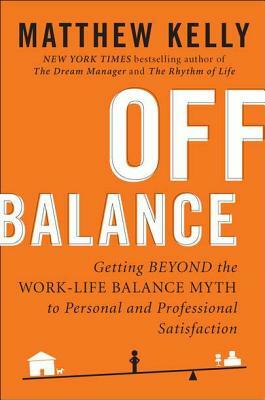 But Matthew Kelly believes that work- life balance was a mistake from the start. Because we don't really want balance. We want satisfaction. Kelly lays out the system he uses with his clients, his team, and himself to find deep, long-term satisfaction both personally and professionally. He introduces us to the three philosophies of our age that are dragging us down. He shows us how to cultivate the energy that will give us enough battery power for everything we need and want to do. And finally, in five clear steps, he shows us how to use his Personal & Professional Satisfaction System to establish and honor our biggest priorities, even if we spend a lot more time on some of the lesser ones. Matthew Kelly is an internationally acclaimed speaker and author, as well as the founder and president of Floyd Consulting. Over the past decade, he has given more than 2,500 keynote presentations and has done conventions for Fortune 500 companies, national trade associations, professional organizations, universities, churches and nonprofits. He lives in Cincinnati. Visit floydconsulting.com.